The available properties for sale have drastically decreased from 2014 to today. The market fell from 2,714 active Residential properties for sale to only 2,013, this is a 30% change in available inventory. The Days on Market decreased 32%, from a high of 227 in 2014 to 165 in 2016. 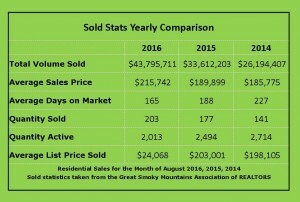 On a positive note for sellers, the Average Sales Price increased 15%, from $185,775 in 2014 to $215,742 in 2016. So if you are looking to buy, today is the day before prices increase out of your range or from simply a sheer lack of available property, you can’t find your dream home.